I think we can all agree that hash browns are awesome, and a hearty plate of them drizzled with ketchup alongside runny fried eggs and some crispy bacon makes the ultimate hangover fare. But they don’t have to be relegated to a greasy diner breakfast. 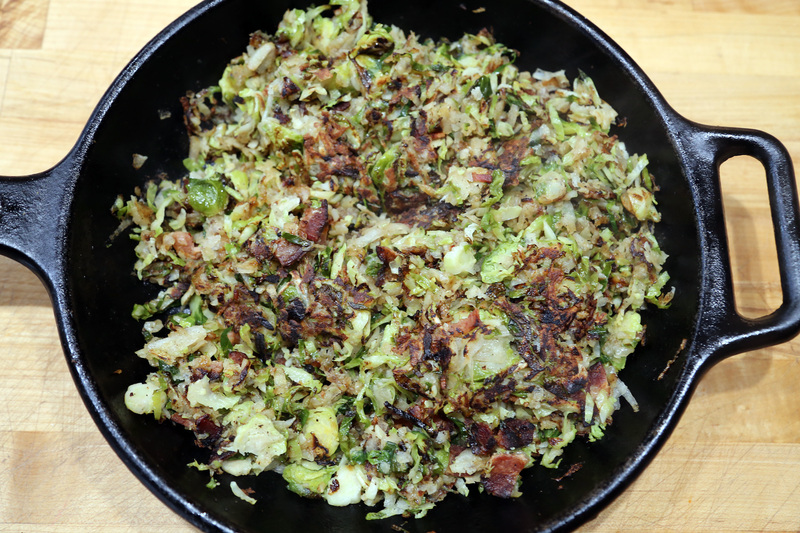 This homemade version gets a makeover, with the addition of delicately bitter Brussels sprouts, sweet onions, and bits of salty bacon. 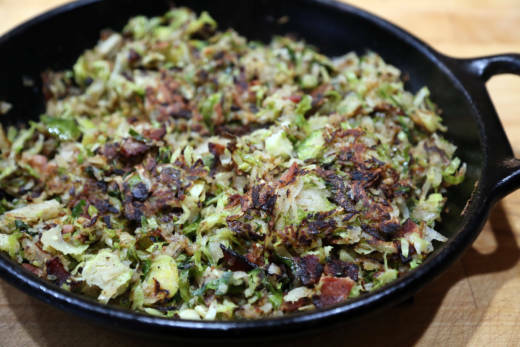 These upscale hash browns are so good that I plan to serve them for Thanksgiving dinner (I’m always looking for a new and decadent way to serve Brussels sprouts). They are terrific as is, but you can, of course, gild the lily by drizzling them with a tiny bit of aged balsamic. If you plan to do that, I’d suggest using the best you can afford (the more syrupy the better). 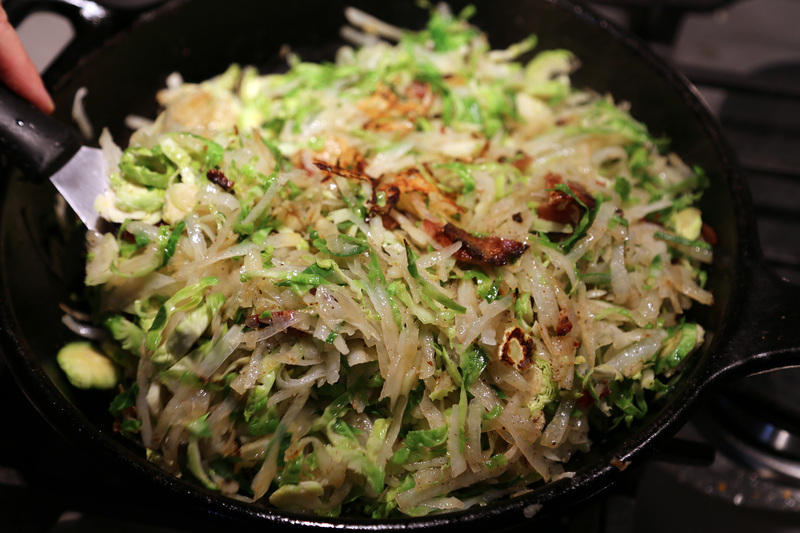 If you want to keep these vegetarian, omit the bacon and use 3 tablespoons unsalted butter or olive oil instead. 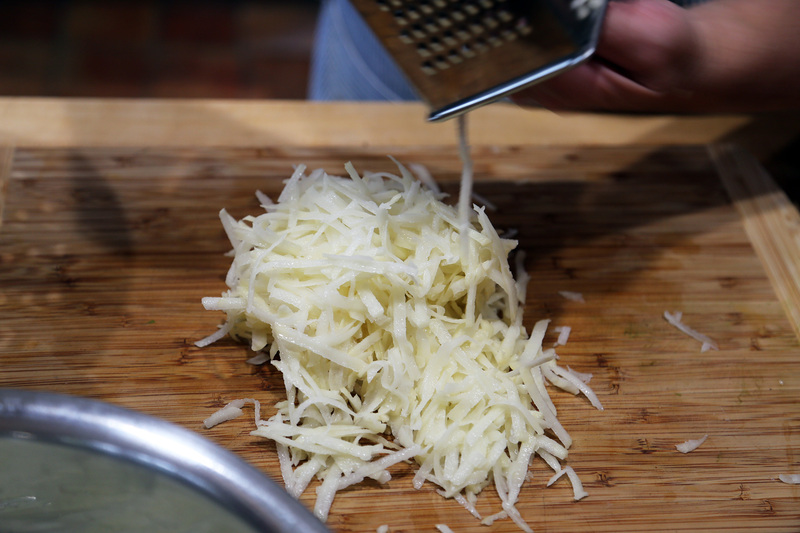 Shred the potatoes using the shredder insert in your food processor or by hand on the large holes of a box shredder-grater. 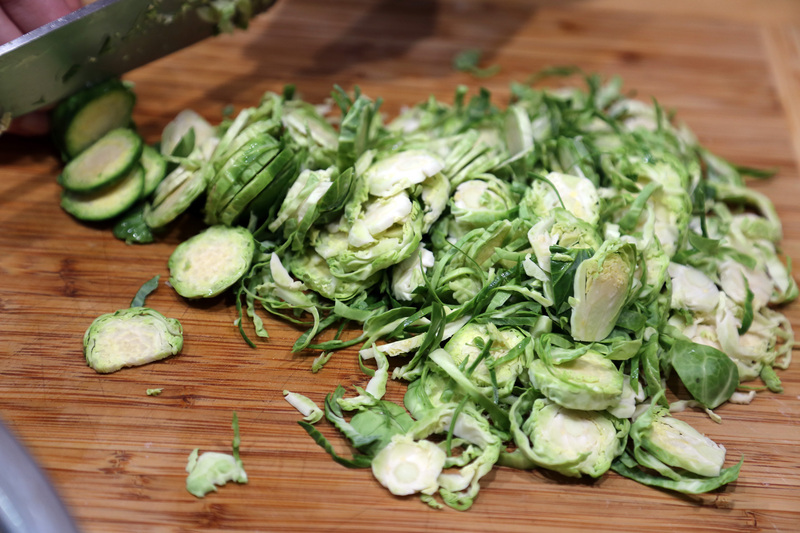 Immediately transfer to a bowl of cold water (this keeps them from turning brown and also removes some of the starch.) Let sit while you fry the bacon. 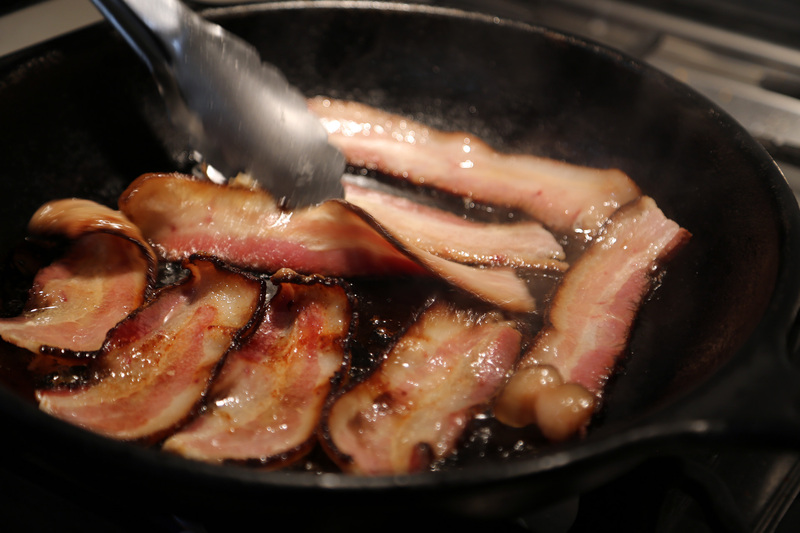 In a well-seasoned 12-inch cast iron or other heavy frying pan, fry the bacon over medium heat until the fat is rendered and the bacon is crisp. 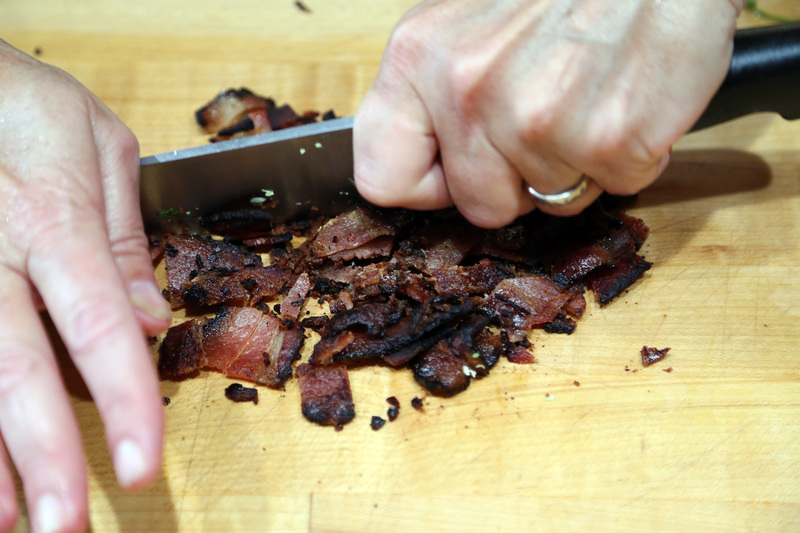 Transfer the bacon to paper towels, and when cool enough to handle, crumble or chop into roughly 1/2-inch pieces. 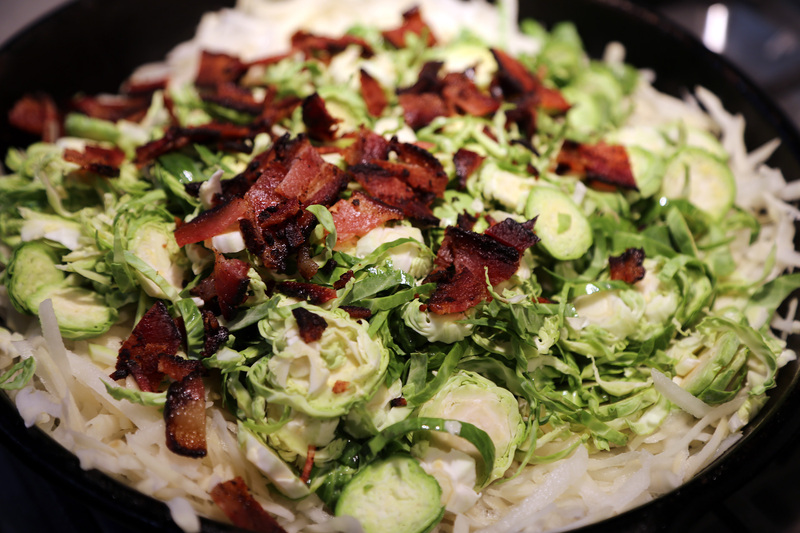 Leave the fat in the pan. 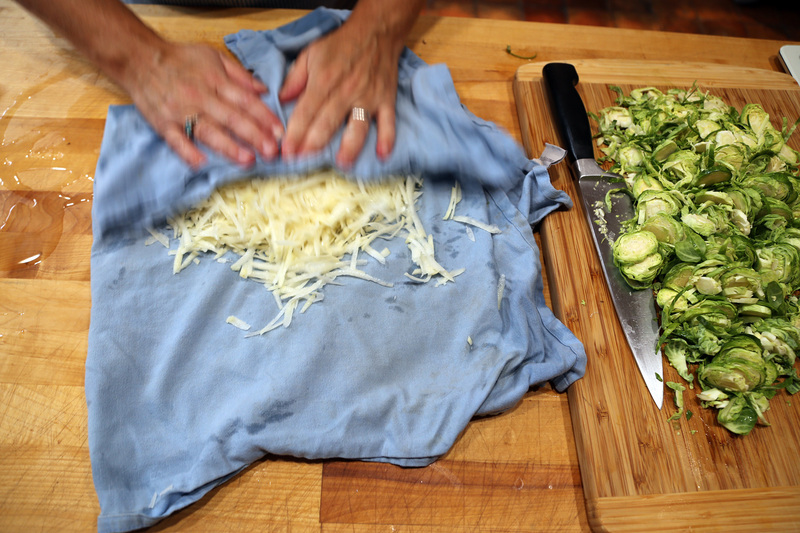 Drain the shredded potatoes and transfer to a dry kitchen towel. Press out as much water as possible. 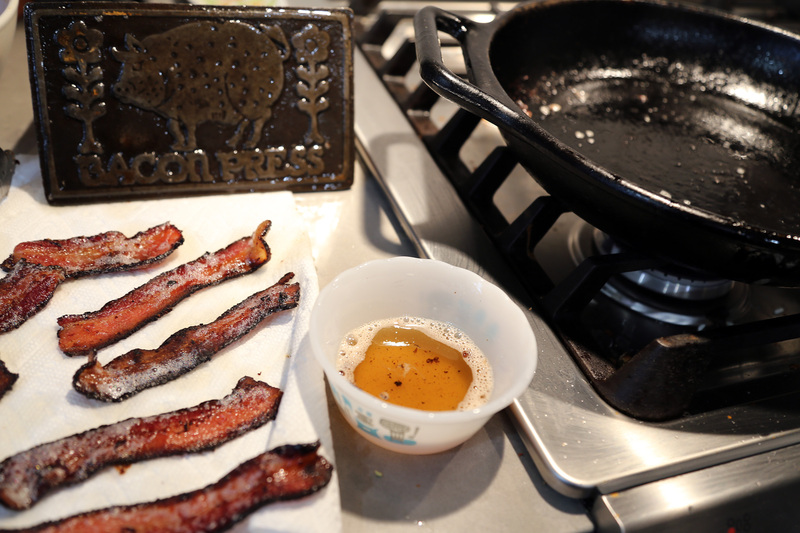 You should have about 3 tablespoons bacon fat in the pan. 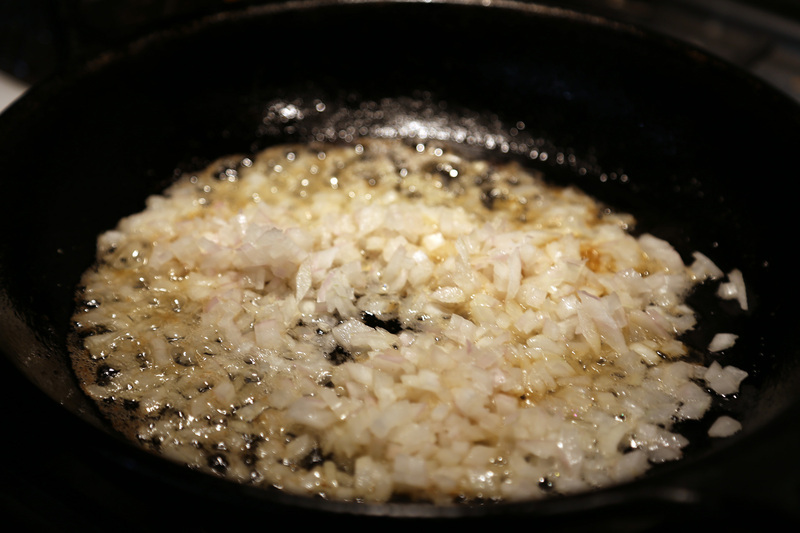 If not, add enough olive oil to make 3 tablespoons total (or pour off any excess). Heat the pan over medium heat. 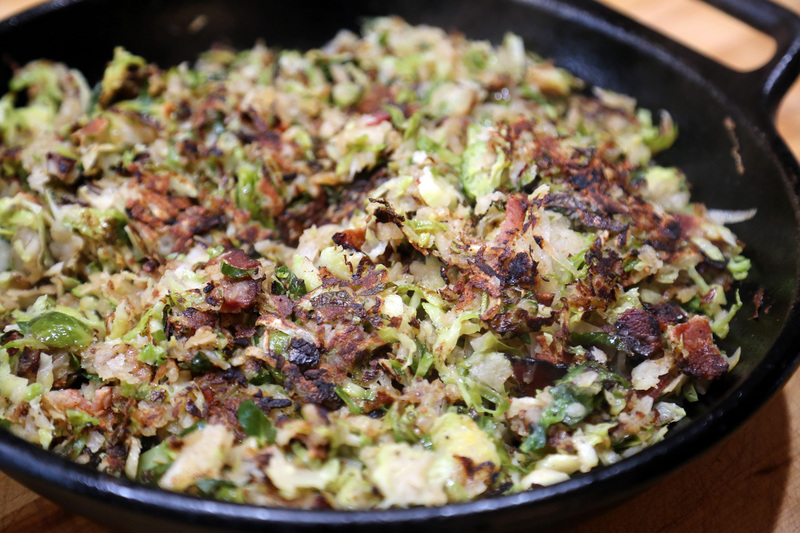 Add the onion, potatoes, Brussels sprouts, and crumbled bacon, in that order, then stir to mix. Season with salt and pepper, then cook the mixture until golden brown and crispy on the bottom, stirring only enough to keep it from burning. 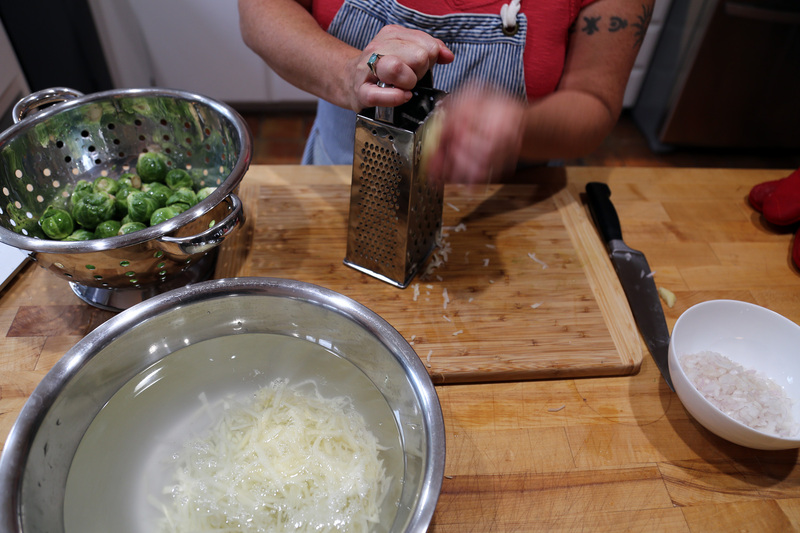 Turn occasionally with a spatula once the bottom becomes crisp. 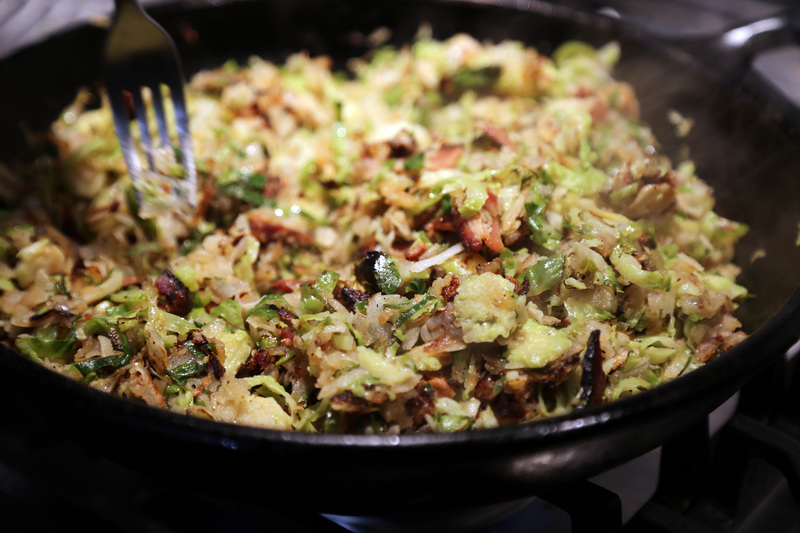 Continue cooking until crisp and golden brown and tender throughout. Drizzle with the balsamic and serve at once.